Clerical celibacy is an absolute prerequisite when it comes to being ordained as a Roman Catholic priest; the objective of this celibacy is to help the clergy focus their energies on serving God. Now, if you ever attended biology lessons, then you should be able to do the maths (or should that be biology?) and realise that priests can never father children of their own. However, this clerical celibacy doesn’t mean that a priest can’t become a father in familial terms. It’s perfectly possible, but the relationship just needs a little tinkering as seen in Father Matthew’s Daughter. 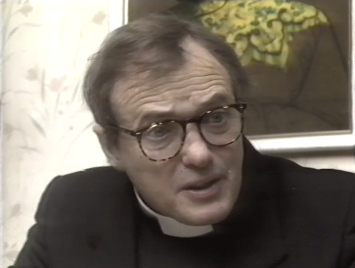 Previously an agnostic Fats Waller fan in a jazz band, Father Matthew Fitzstanton (James Bolam) is a scatterbrained priest serving God’s children in Fulham. Keen on repeating himself midway through sentences and twisting everyone else’s sentences into absurd statements, Father Matthew remains a sage fellow despite his obvious eccentricities. 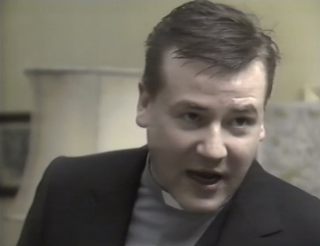 Serving alongside Father Matthew in the parish is Father Charlie (Ray Winstone), a rough and ready curate with a love of fruity sauce and Miss England. Following a plane accident in South America, Father Matthew’s sister and brother-in-law have died and their last will and testament contains a surprise for Father Matthew. With their final wish being that Father Matthew takes guardianship of their eight year old daughter Holly (Samantha Hurst), Father Matthew is in a quandary. After all, he, a priest, can’t tear his dedication away from God, but neither can he palm off his own niece to an adoption agency. Thankfully, Father Charlie has a solution and suggests that his broody sister looks after Holly. Despite being run ragged by her four boys, Sharon (Gabrielle Lloyd) reluctantly agrees to take on Holly after Father Charlie plays upon her distrust of adoption agencies and her desire to have a little girl. Holly’s arrival in the UK is certainly no easy introduction, though, as she decides to lock herself in the plane’s toilet and refuses to come out. Eventually, Holly relents and takes up residence in Sharon’s house under the keen guidance of Father Matthew, but life remains far from simple. Upended from what Father Matthew terms her life in the jungle, Holly struggles to adjust to life in Fulham with her new family. No sooner has Father Matthew resolved Holly’s issue with eating food than the death of her rabbit is causing her to denounce God and threaten agnosticism. Further tests await Father Matthew in the form of Holly’s painfully modern new school while Holly’s desire for Father Matthew to marry leads to all manner of debate on his position as a priest. 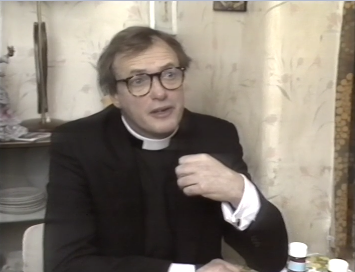 Father Matthew’s Daughter consisted of six 30 minute episodes which aired on Monday evenings at 9pm on BBC2 in 1987. The series, written by husband and wife Terence Brady and Charlotte Bingham, only received one airing and was never repeated. Brady and Bingham had previously written a number of comedies including Take Three Girls, Pig in the Middle and No, Honestly alongside dramas such as Upstairs, Downstairs and its spinoff Thomas and Sarah. Directing the series was David Askey who had previously worked with Brady and Bingham as well as Bolam on No, Honestly and When the Boat Comes In respectively. Askey was a comedy director of some repute with his CV taking in Doctor in the House, Galton and Simpson Comedy, the Sid James starring Taxi! and The Fenn Street Gang. Curiously, Askey had also directed the sitcom Bless Me, Father which featured Arthur Lowe as a Catholic priest. 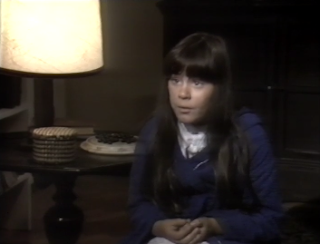 With Father Matthew’s Daughter, Askey would be directing an idea which had originated almost two decades before with the writers. Brady and Bingham had previously known a Catholic priest who, following the death of his sister, had found himself taking guardianship of his niece. This priest had not always been a priest and, as with Father Matthew, led a very different life when the will was drawn up. However, rather than being a freewheeling member of a jazz band, this very real priest had previously been a soldier. 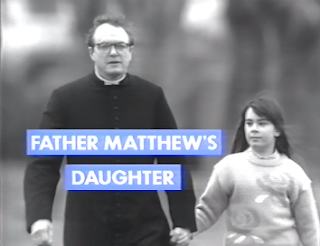 Although officially categorised by the BBC as a sitcom, Father Matthew’s Daughter has much more in common with the genre known as comedy drama. Dispensing with a laugh track and containing virtually no dialogue that subscribes to the setup/punchline structure, Father Matthew’s Daughter is a very different beast compared to other priest-based comedies like Bless Me, Father and Father Ted. Instead, Brady and Bingham craft a more gentle, naturalistic universe for Father Matthew. It’s an intriguing and brave area of society to tackle and, although the concept of Catholicism appears to be somewhat immune to criticism here, Father Matthew’s Daughter manages to remain honest to its characters and grants them a real world essence. And, perhaps part of the success with these characters, is down to the rather special cast bringing them to life. With a career on screen lasting well over 50 years, it would be preposterous to assign James Bolam anything less than legendary status. And, having made an indelible mark in the comedy world with the roles of Terry Collier and Roy Figgis, Bolam is truly a master of comedic acting. It’s a pedigree which serves him well in Father Matthew’s Daughter. 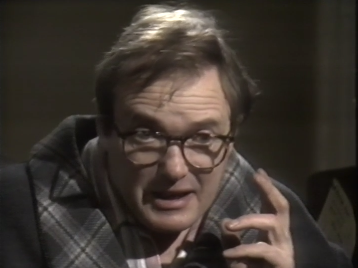 With a script that calls for a certain amount of verbal dexterity, Bolam manages to navigate Father Matthew’s unconventional speech patterns and ingrain them with an amiable warmth. Coupled with a face capable of expressing incredulity just as quickly as a knowing smile, Bolam is perfectly placed to create an engaging central figure in Father Matthew. Ray Winstone is less well known for comedy than Bolam, but has appeared in a number of comedies throughout his career that include Fairly Secret Army, Get Back and Minder. Winstone’s salt of the earth ferocity generates a pleasing juxtaposition with his character’s religious background and provides a more straightforward point of view for Father Matthew to muse upon. Unfortunately, Winstone’s screen time in Father Matthew’s Daughter is rather limited and his appearances in the series are only fleeting. Gabrielle Lloyd, meanwhile, captures the role of an overworked and stressed mother perfectly, but it would have been nicer to see her given a little more range, shackled, as she is, to domestic duties. Samantha Hurst, as Holly, is performing in her first major role on television and, unlike many other child actors, comes straight from local drama lessons rather than stage school. It’s a confident, if unremarkable performance, from Hurst, but she manages to bring an element of fragile sweetness to the role. Much like many child actors thrust into the limelight, an adult career in television failed to materialise with only sporadic appearances following in Ain’t Misbehavin, Emmerdale and Heartbeat. The actors find themselves in a series of narratives that examine not only Father Matthew’s attempts to come to grips with guardianship, but also the period of adjustment that Holly must undertake. The series is at its best when it combines Father Matthew’s faith with Holly’s innocence and, as in the episode where Holly goes on strike from religion, the resulting denouements feel most satisfying and touching. Other episodes, at times, feel a little lacklustre in thrust such as the final episode which concentrates on Holly’s failing grades at school. The plot is a little too slight – even if, again, the payoff is sweet – to fully make a mark on your memory. Even then, though, there’s still time for hilarious insights into modern teaching such as her school’s decision to label classwork as “basic acquirement” to help nurture a child’s self-esteem. Balancing drama nicely with comedy, thanks in part to Bolam and the writers’ vast experience in both, the episodes play out with an engaging tone and are the perfect length. A more traditional comedy drama setup, with a running time of 45 minutes to an hour, would perhaps have stretched the rather simplistic, yet no less enjoyable, plots. Nonetheless, there’s certainly room for a little more philosophical conflict between Holly’s childlike innocence and the established, age old teachings of Catholicism. With a fantastic cast in place and backed by an established writing duo, Father Matthew’s Daughter would have to try very hard to disappoint. Sure, it doesn’t dig too deep into its foundations to explore any notions on the flexibility of religion, but not everything needs to be so aggressive in comedy. Sometimes a gentle and simple watch with a few light laughs is enough. A second series would have probably suffered a diminishing return as the basic premise had already been explored fairly comprehensively, but there’s enough in Father Matthew’s Daughter to placate any fan of British comedy.